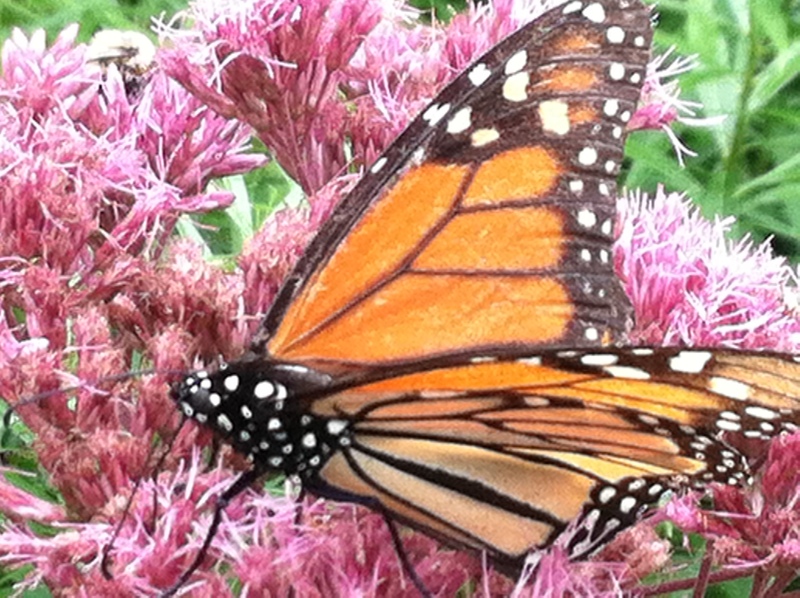 If you want to grow the ultimate flower buffet for butterflies and bees, try Joe Pye Weed. When there isn’t much else blooming, Joe Pye will surprise you with fuzzy pink umbels of flowers that flying insects clearly relish. I planted only one plant of the great late summer bloomer, Eupatorium dubium, ‘Little Joe’, which has spread to cover an area about 5 feet by 5 feet. After 5 years of growing this plant, I have found it not to be invasive but it definitely spreads. When it goes beyond its bounds, it is easy to pull it up. In late summer, my ‘Little Joe’ patch has formed a nice clump in front of my greenhouse; it has finished blooming but I keep it up for structure. It will get taller as the summer progresses. ‘Little Joe’ tops out at 4 feet tall, as opposed to the more commonly grown ‘Gateway’ which can get up to 7 feet high and can flop. I hate to stake flowers, so picked ‘Little Joe’ to avoid that fate. Now there is another cultivar called ‘Baby Joe’ which only gets 2 to 3 feet high which I need to try next. Joe Pye is a native wildflower which grows along streams in the wild near my house. It gets enormous! I stayed away from it for years because of the size and difficulty in siting such a large specimen. But I am in love with ‘Little Joe’ which has beautiful burgundy stems. Once the flower starts to bloom, I am sure to see at least a half-dozen different types of bees and butterflies landing, and the other day saw 5 Monarchs resting on my one plant! Swallowtails on Joe Pye; this is the full size one that towers over me! ‘Little Joe’ comes in a ‘garden friendly’ package of a plant that is easy to grow in full sun to part shade and has sturdy stems that will support the flower heads and won’t bend or flop. The plant is drought tolerant and fragrant with mauve purple flower heads which can reach 12 inches across! The flower persists for weeks and the seed heads will last through the winter and will provide food for the birds when food is scarce. What is not to like? A tough beautiful, easy to grow plant which provides entertainment. I visit it every day to see what insects and butterflies have made a visit. 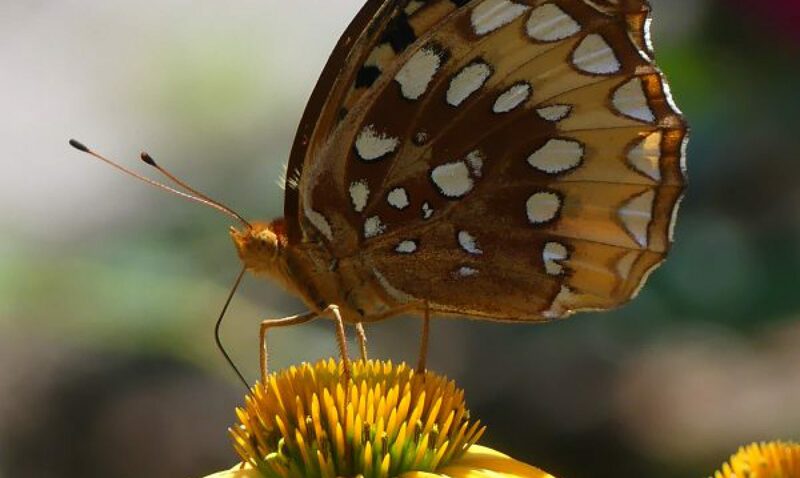 For more information on planting pollinator plants, go to my posts Creating Monarch Waystation and Plant These For the Bees. Also, my Garden Plan for Pollinators is a good resource. The Tattered butterfly is amazing and looks like its escaped from a Harry Potter film! I had one last year, but i put it in the wrong place, so I pulled it out. I will ring another place for one. It is so wonderful at this time of year to have blooms that are attracting the ravnenous swarms!